I have had a great experience with HRT (TRT) overall. It has been a life changer - positively of course - and helped me in my relationship with my wife, my career and I am convinced my general health and personal psychology. That said, I had absolutely no idea what I was doing when I got on testosterone and no doctor ever told me about any of the risks associated with it. I personally was blindsided by an issue, for example, that I will discuss below. Why do physicians not give full disclosure? Well, many of them simply know very little about testosterone therapy and are on end the early stages of the learning curve. Still others feel financially and time constrained. Finally, it is clear to anyone following the industry that there are many out there who just want to grab your money before they tell you about any potential issues. 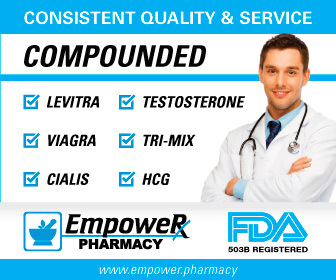 Many of you have seen very aggressive advertisements from testosterone manufacturers and HRT clinics for example. NOTE: HRT has its risks, but it also has incredible potential rewards. I cover those in my page called The Benefits of Testosterone. 1. What if Have to Go Off of HRT? I was stunned one day by my HRT clinic. They were the ones that started me on testosterone cypionate and cypionate powerfully changed my life for the better: it vanquished my dysthymia (mild depression) and gave me morning erections for the first time in my life. My libido went through the roof; my boss commented how much easier I was to work with; and my erectile strength improved, etc. However, everything came crashing down when my HRT clinic told me that I had a PSA read of 6.3 - my baseline was 1.4 or 1.5 - and that I had to immediately quit testosterone until I got urological clearance. I was horrified. Not only might I have prostate cancer, but, even if I didn't, I had to have a prostate biopsy and no T for an indefinite period of time. One month after quitting HRT, my testosterone was 111 ng/dl! That was probably about an eighth of my average testosterone over the last year. I was miserable when my testosterone was in the low 300's and I could not bear the thought of living with levels in the 100's and 200's for months and months..
On the Peak Testosterone Forum, this is not a very common issue, but it certainly can happen. Furthermore, considering that prostatitis can raise PSA very significantly, the percentage of men on TRT facing the issue over many decades can probably be significantly magnified. In addition, there are other issues that I have seen take men off of HRT: high, persistent hematocrit / hemoglobin and high blood pressure. Some men cannot get these in line even if they donate blood and thus are forced off of HRT due to stroke/heart attack risk concerns. Still other men find that testosterone raises their blood pressure and/or pulse. So discuss these kind of risks with your physician before you go on HRT and find out how he or she handles it. a) After three months, they notice little change from HRT, i.e. no real benefit. b) They had some improvements for a few days or weeks, and then the honeymoon phase was over and they have felt nothing for several months. Sometimes these can occur because of a lousy protocol. However, that is certainly not always the case. There are many other reasons that HRT can have little effect, but I would guess the most common is that more than one issue is going on. If a man has gut issues, sleep disorder, high prolactin, insulin resistance, hypothyroidism, etc., these can override any benefit that a man might get from increasing testosterone. Other reasons are low SHBG, which makes HRT much more difficult to dial in. In addition, some men just don't need high levels of HRT. We had one younger man on the Forum who really struggled with HRT and then just decided to go off of it. He felt fantastic almost immediately! 3. Possible Decrease in HDL? There are a few studies that show that testosterone can lower HDL. On the other hand, there are more studies that show no change, except perhaps at supraphysiological levels, i.e. > 1200 ng/dl. Testosterone improves many cardiovascular parameters, so some say this concern can be dismissed. I think a more prudent approach is to take an HDL read before and after HRT and see if it is an issue for you individually. It probably won't be, but you never know until you check. You can use my page Testosterone Labs for inexpensive self-testing if you need to. 4. Partial Shutdown of Various Hormones. Exogenous (outside-the-body) testosterone therapy will partially turn off signaling at the hypothalamus. And this, in turn, turns off (partially) the signaling that goes to the pituitary. Theoretically, only the testosterone cascade should be affected by this. For example, we do indeed see the sister pathway shutting down fertility in men. But can this shutdown affect other hormones, such as DHEA, progesterone and cortisol? These should not be affected, but some men have reported decreases in the hormones. Furthermore, one of the most well-known HRT physicians out there has reported that DHEA often shuts down and thus prescribes the same for most of his men on testosterone. I know that I have been on cypionate for a couple of years and my DHEA was quite low - basically at the bottom of the scale. I can also tell you that I feel very good, though, and I would never have known it if I hadn't taken the measurement simply out of curiosity. But on the Peak Testosterone Forum we have seen men experience nice improvements in libido and/or morning erections using DHEA, so this could definitely be an issue. Low cortisol can also be a very negative issues, leading to tremendous fatigue. 5. Can I Get My Old Testosterone Level Back? Let's say one has to go off of HRT. We all assume that, after a few months of pain and suffering during the rebound period, we will get our old baseline testosterone levels back, right? For example, I was always in the lower 300's before I went on HRT. So, if I quit HRT for some reason, I would expect to go below 300 for several months and then come back to the lower 300's at my old baseline level. Unfortunately, this appears not to be a given. Some men, especially older, never bounce all the way back apparently. NOTE: This probably can be avoided by simultaneously going on HCG, which keeps the testes active and restores volume. 6. Existing Hypertension. I do not have a study to prove this, but I have spoken to a doctor and, separately, an HRT clinic that stated that some men with hypertension will actually experience a rise in blood pressure after receiving testosterone therapy. In fact, the doctor was quite upset, because she had heard that some of the HRT clinics were not monitoring blood pressure and that taking vitals is an obvious and necessary protocol during any medical exam. And she had a point: perhaps some clinics will get themselves into trouble by ignoring this easy step. The bottom line: if you have high blood pressure, this is something to discuss with your doctor if you are considering going on HRT and something to be monitored during your therapy. And, by the way, I have seen this many times on Peak Testosterone Forum. 8. Feeling Worse on TRT. Some men just never feel good on TRT. And, oddly enough, when they go off of testosterone therapy, they feel much better and are glad they got off of it. Now one could argue that this is because they had a lousy protocol. On my page Feeling Worse on Testosterone Therapy, I discuss some examples where, in my opinion, it likely was not the protocol that was the root cause of the problem: these guys probably should have never been on testosterone in the first place. 9. Negative Psychological Effects and Even a "Freak Out". Testosterone really affects the male brain. Generally, the changes are very good as mood and libido are lifted and depression, anxiety and mental fog are decreased. However, sometimes the changes are overwhelming and can induce very disturbing emotions and psychological states. Some men actually get more depressed and find that their mood is negatively impacted. This may be from high estradiol - many doctors mistakenly do not manage or monitor this ultracritical hormone that rises with HRT - or from the above shutdown process. But this is not always the case. "On the day 5 after insertion in the evening I suddenly felt an agitated state of mind, and tension. It almost feel like I have intoxication and high blood pressure. I woke up at night with heart palpitations, uneasy feeling in heck/head, and feeling of being depersonalized, as if things were happening not in this reality. I never felt anything like that before. It was scary/horrifying. This night I slept maybe 3 hours total. In the morning I started to feel that it is getting worse. In fact, symptoms resembled heart attack. So I went to GP, she measured blood pressure – 122/74, normal. Pulse rate was elevated to about 100. So it appeared to be an anxiety/panic attack."